Do you know settings for track color depending on altitude in Locus? You don't need any additional signs. Sory I dont know how it works.To say true i have problem to set colours of the track in Locus. I wanted for ex, red but on map i see orange. I remember something like this ( coluor depending on altitude) in Two Nav on Pc in CompeGps Land but it was not so readable. In my opinion signs are easier to interprate. I don't need altitude on every points of the track it is enough only to see where there is top or bottom of the climb. Try: Track > edit > appearance > mode > altitude / speed, etc. Can you show little screen how it looks like. Today i don't have Android with me, can not try. Interesting. Never thought about this. If you need information about ascending have a look into the track -> diagram. This is exactly what i saw on TwoNav. Once tried then I forgot about it. But still i think ''elevation signs'' can be at least complementary to this colours. This ''winter'' I made few bicycle trips with my brother Etrex 30, since then i like ,,elevation signs'' very much. Red colour means we are on the top of the hillon our track or we are just on high altitude in this case more then 2000 meters ? For ex when you created route ( on normal poved roads) from Insbruck then Solden to Tiefenbachgletscher on about 2800. How it would looks like ? 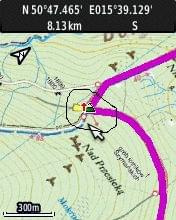 I know in Locus we can see information about the track , chart ascent, descent etc . But this little icons we see on the map we don't have to seek, think and click anywhere. 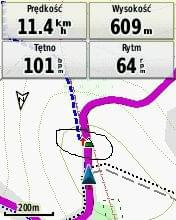 In Garmin they are appeared automatically after you press ,,GO'' along selected track. top is red, bottom down is blue, independing of real altitude / Höhenmeter. Thx, good that it is independing of real Altitude. I have to try . Interesting how good it is on small lets say 1-2 km hill. Garmin sometimes catches even small difference. thx, I love this feature! Just found it by reading through this post. I love this feature too, but I wonder if it is possible to show the altitude color changes when navigating (navigation line)? Now I can see the altitude on a track, but as soon as I start navigation, I get the normal solid colored navigation line.